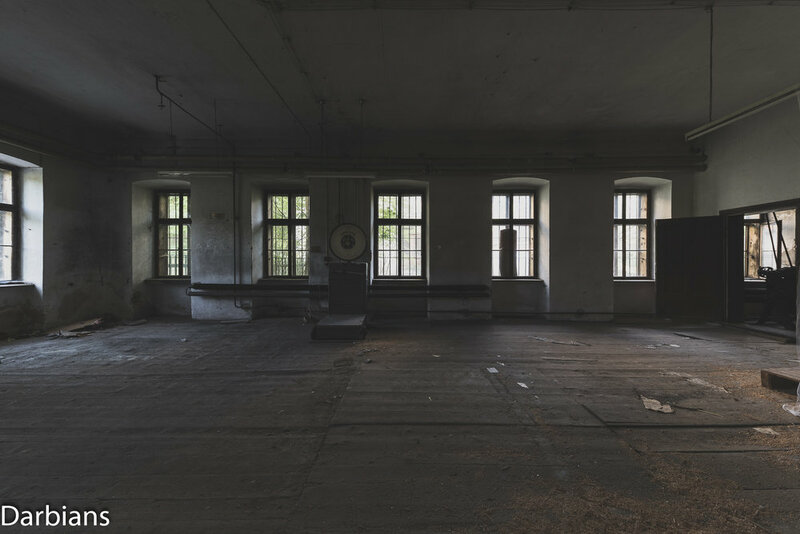 We find this abandoned textile mill hidden down a quiet lane in Waldviertel, an isolated region of Austria, near the Czech border. So much machinery is left here. Its more like a museum than an abandoned location. Machines are still full of yarn and fabric, it seems like they just closed for the weekend and will return to carry on production on Monday. However the site has been closed for nearly 15 years! The mill was founded in the early 1800’s as a hand weaving mill. Johann Anderl relocated to this site from Vienna. The area was popular for textile mills at the time and being located by a river aided to a free source of energy. The hydro power aided in bringing in new processes and technology to compete with the other local mills. During WWii production ceased and the factory was used by Felten & Guilleaume for producing telecommunication materials for the military. After the war, Hans Anderl took over the running of the mill and in 1950 started they strarteds producing Vigogne, a blend of cotton and sheep’s wool. This increased the workforce to over 200 and at its peak nearly 300 people were employed at the site. Further steps were taken at modernisation in the late 1960’s and the workforce decreased. After struggling for sometime the mill eventually closed in 2004. Feel free to follow me on the social media below and add you email to the box for notifications of future posts on here. External of the office, residential block and an empty warehouse. Yarn still lays in these machines. 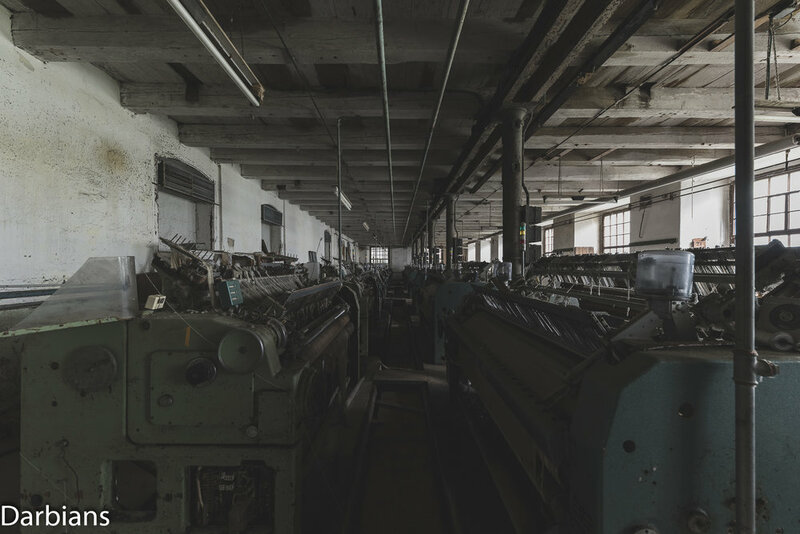 Fabric and yarn still lays in the machines. A rather empty room housed this Moritz Jahr Gera contraption which was part of the dyeing process. Large vintage Schember Waage scale sits alone in this room. Another vintage machine which I believe to be part of the dyeing process. These machines were part of the printing process. Up close to a printing machine. Judging by the foot pedal this old machine was manually operated. Spinning machine with large wooden storage. Another view of the spinning machine. What seems to be a huge bobbin in a room with spinning machines. Stairwell leading to toilets and stenter machine shop floor. Stenter machine floor. These machines gauge the thickness of the thread. The large Schlafhorst finishing machine was fed by yarn from here which it weaved into fabric. Infeed of another finishing machine. The setting sun laid a beautiful warm glow on these spinning machines. I then had a wonder around with abandoned mill the 50mm. Silhouette of a spinning machine. Close up of spinning machines. Machines are fed from the above floor and gauge the thickness of the thread. Yarn backlit from the setting sun. Seems like they are just on their tea break. Shop floor. The green, amber and red lights look out of place with the old machinery. External showing Residential and office areas. The other side of the residential and office areas. Certainly didn’t expect to find a grand piano in here. Books remain in this part of the living area. Bedroom with a beautiful wooden carved bed. The light hit the bookcase of binders perfectly. The used clock cards were in remarkable condition. Vaulted ceiling with large wooden supports. Big thanks to Andy From Behind Closed Doors his article was a great source of information for this article.